APJC alumni Lisa Martin has won an international development media award for her coverage of domestic violence in PNG. Martin, who works in Canberra as a political reporter for AAP, received the award at the annual conference in Melbourne of Australia’s peak aid body, the Australian Council for International Development. 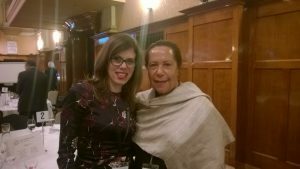 She is pictured here at the conference with with Dame Meg Taylor, secretary-general at the Pacific Island Forum. Martin’s winning articles were ‘Home is where the hurt is in PNG’ – and ‘Bride price not blamed for PNG violence’. ACFID’s judging panel commended Martin not only for the pieces but also her “follow-up on the key issues” including one-on-one interviews with the Papua New Guinean prime minister and posing questions in a public media conference. “Ms Martin’s consistent reporting on development issues has provided the basis for informed debates to take place amongst the public and within the NGO sector,” he said. Martin was a fellow of APJC’s 2014 China Australia Journalism Exchange and in 2015 took part in an APJC workshop on reporting international development.